We are pleased to welcome you to our practice. Our commitment is not just in meeting your expectations, but in exceeding them! Because we know how much your eye health and appearance can mean to the quality of your life, we are focused on patient care and committed to excellence in servicing your complete eye care needs. Pleasant Valley Eyecareis the leading eye care provider in the Parma/Seven Hills area. With an extremely knowledgeable doctor, a wonderful support staff, great prices, and modern technology, you can trust your eyes to Pleasant Valley Eyecare. Pleasant Valley Eyecare was founded in 1981 in Parma, Ohio by Dr. Gary Crapanzano, O.D. Treatment of pink eye, allergic reactions and corneal abrasions. At Pleasant Valley Eyecare we have an in-house lab for preparing lenses and assembling prescription eyeglasses and eyeglass frames. Minor eye glass repair and frame adjustments while you wait. And In-house lab for quicker turn-around time. Dr. Crapanzano's educational background began at Ohio State University where he received a baccalaureate in Microbiology in 1975. 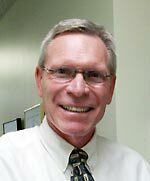 His professional training was compleated at Illinois College of Optometry where he received his Doctorate of Optometry in 1980. He has also completed two internships: one at the State University of New York in Pediatric Vision and the other under Dr. Eleanor Faye at the New York Lighthouse for the Blind in Low and Subnormal Vision. He also co-manages cataract, refractive, and lasik surgeries. He is licensed to prescribe medication to treat eye infections and glaucoma. Dr. Crapanzano and his entire staff are dedicated to serving your needs, and can address all vision concerns such as the diagnosis of cataracts, glaucoma, floaters, macular degeneration and diabetes-related conditions. Dr. Wiley received a B.A. in Chemistry from the University of Virginia, then attended the Medical College of Ohio. During a rotation in medical school in Russia, he worked with Dr. Svyatoslov Fyodorov, the pioneer of modern refractive surgery. Dr. Wiley received honors from Harvard Medical School during an advanced ophthalmology rotation. Dr. Wiley's credentials continue beyond his education. He's worked in China, Russia, and India studying the latest refractive techniques. He is currently medical directory at Clear Choice, the Cleveland Eye Clinic and Toledo LASIK Center. Dr. Wiley is our co-managing LASIK ophthalmologist for those patients interested in having refractive surgery. Dr. Gregory Louis, a native of Cleveland, is a graduate of John Carroll University, the University of Cincinnati College of Medicine and trained in Ophthalmology at the Cleveland Clinic Foundation. He is a Diplomate of the American Board of Ophthalmology. Dr. Louis served as an Ophthalmologist in the U.S. Air Force, four years at the Travis A.F.B., California and participated in Operation Desert Storm. Dr. Louis is our on-site ophthalmologist for our patients with surgical needs such as cataract or eye lid surgery. Laser vision correction is the opportunity to see clearly without contacts or glasses. In many patients, laser vision correction reduces or eliminates nearsightedness, farsightedness and/or astigmatism, effectively decreasing their dependency on corrective lenses. Many patients achieve 20/40 vision or better. To see better than you currently do with an up-to-date prescription. To eliminate the current or future need for reading glasses. To improve amblyopia or lazy eye. To prevent the occurrence of ocular conditions such as cataracts or glaucoma. After you are positioned properly, a numbing drop will be placed in your eye and a gentle eyelid holder will be used to hold your eyelids open. The surgeon will create a thin flap on your cornea using either the IntraLase laser or a hand held instrument called a microkeratome. The process takes only about 30 seconds from start to finish - it's quiet and it's comfortable. You will leave the surgery center wearing a special pair of sunglasses, to protect your eyes from the sunlight and outdoors, and prevent you from rubbing your eyes. Once you get to your car, close your eyes for the ride home. Glaucoma is a disease that damages the optic nerve and is one of the leading causes of blindness. It occurs as a result of an overproduction of aqueous fluid or when the drainage system becomes blocked, causing fluid pressure to increase. The high pressure causes damage to the optic nerve, resulting in permanent vision loss. Congenital glaucoma presents noticeable symptoms in an infant such as enlarged eyes, cloudy cornea, light sensitivity and excessive tearing. Pleasant Valley Eyecare has the technology for early detection of Glaucoma. Macular degeneration causes distortion and loss of central vision and is the leading cause of blindness. The breakdown of the macula, the central focusing portion of the retinal tissue, is the underlying cause. It is commonly a natural result of the aging process and has been linked to ultraviolet light exposure. We are providers for VSP, Medicare, Aetna, Anthem, Apex, Caresource, Eyemed, Medical Mutual, Suma Care, Spectera, United Health Care, Humana, Cigna, TriCare, Kaiser and Mutual Health Services (Cleveland Clinic). We do not accept outside prescriptions. Take I-480 to I-77 South. Exit I-77 at Exit 153 / PLEASANT VALLEY RD. Turn left (west) onto PLEASANT VALLEY RD 1.9 miles. Turn Left on BROADVIEW RD (OH-176) go 0.3 miles and Pleasant Valley Eyecare will be on your right-hand-side. Take I-77 North and exit 153 at PLEASANT VALLEY RD. Turning right (west) onto PLEASANT VALLEY RD 1.9 miles. Turn Left on BROADVIEW RD (OH-176) go 0.3 miles and Pleasant Valley Eyecare will be on your right-hand-side. Take I-90 West to I-77 South and exit 153 at PLEASANT VALLEY RD / Independence. Turn left (west) onto PLEASANT VALLEY RD 1.9 miles. Turn Left on BROADVIEW RD (OH-176) go 0.3 miles and Pleasant Valley Eyecare will be on your right-hand-side. Contact our office directly at 216-642-5500. For emergencies, please call 216-973-0121. For new and former patients, we request that you please complete a new Patient Information & Medical History Form, and include your insurance information in order to better serve you. 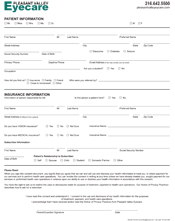 Please bring the completed form along with proof of insurance when you arrive for your appointment.